Two thirds (65%) of program respondents reported walking, bicycling, or taking transit more often because of the program. The program successfully engaged racially-diverse, traditionally marginalized communities. The City of Chicago Complete Streets website includes links to customized neighborhood transportation maps, infographics with evaluation results, and social media links for each Go Program. The Go Program was developed by the City of Chicago’s Department of Transportation (CDOT) in collaboration with Alta Planning + Design, the Active Transportation Alliance, and local community organizations. Five neighborhoods that span a diverse cross-section of Chicago’s population benefitted from the program over a four-year time frame. Participating neighborhoods included: Bronzeville, Pilsen, Edgewater, Albany Park, and Garfield Park. Reduce vehicle miles traveled (VMT) by area residents. Increase awareness and raise acceptability of modes of travel besides driving alone. Although goals were established at the outset of the program, they evolved according to community input. Goals related to community cohesion and social trust were especially important objectives for community leaders. Neighborhoods were selected based on information about available transportation options, active community organizations, racial and ethnic diversity, median income level, community marginalization, and other metrics. Each neighborhood campaign began with extensive interviews and in-person meetings with local community organizations, transportation advocacy groups, elected officials, and more. Although there is no “ideal” number of community organizations to interview, on average the program spoke with over 25 groups per neighborhood. Interviews collected insights about the communities including barriers that kept residents from walking, bicycling, and using transit and bike share. This level of stakeholder engagement allowed for a high degree of customization for each neighborhood in terms of messaging, branding, and events. The key motivators (“reasons for participating”) varied by community. Overall, the top three were: to explore the neighborhood, to obtain more transportation information, and to gain personal health benefits. Other motivators included meeting neighbors and reducing pollution. CDOT specifically focused on audiences within each community that had been historically underserved. Creating an inclusive, accessible program for those most in need was a core value of CDOT’s approach to this program, which Alta Planning + Design and Active Transportation Alliance strongly supported through program development and delivery. While individualized marketing program target areas are often chosen due to infrastructure, land use, and other indicators of success, CDOT specifically chose target areas that had been historically underserved, while also aiming to have geographic diversity across the city with participating neighborhoods from the south, west, and north sides. A key to the success of the Go Campaign was hiring local Ambassadors from within each community. Stakeholders respected these individuals and were enthusiastic about learning from them through participating in the program. The Ambassadors came to the job with existing, authentic community relationships that helped build trust between the program and residents. Insights from community stakeholders and the Ambassadors helped tailor each program to the neighborhood’s interests and needs. Go Bronzeville - Bronzeville, a predominately African-American neighborhood, is the epicenter of Chicago-style jazz and blues music as a result of the Great Migration. The program’s messaging and branding highlighted and celebrated this history through events such as the Bronzeville Legends Bike Tour and the Historic Church Walk. Promoting health and wellness was another important message that resonated with the Bronzeville community. Events were organized with this in mind, and the GirlTrek Women’s Wellness Walk was one of the program’s most popular, well-attended events. Go Pilsen - Pilsen is a community characterized by its strong connections to residents’ Mexican-American heritage. This culture was celebrated through branding the program with bright colors chosen by residents and meaningfully incorporating important cultural symbols such as the Aztec sun and the eagle and serpent from the Mexican flag on program materials. Materials were translated into Spanish and the program hired bilingual Ambassadors who had a deep understanding of the local culture. The program tapped into the importance of culture, art, and creativity. Organized events included the Mariachi in Millennium Park Bike and Transit Ride, The National Museum of Mexican Art Community Fiesta and Mural Walking Tour, and the Lotería (Mexican Bingo) Community Walk. Facebook was heavily utilized as an important communication channel for announcing events and spreading the word about the program, because it was already a well-used method of communication for community residents. Go Albany Park - Albany Park is known for its diverse population. Area residents or their families moved to Chicago from countries around the globe. This diversity was celebrated throughout the program. Bilingual Ambassadors were hired and select program resources were made available in seven languages: English, Spanish, Arabic, Korean, Serbo-Croatian, Tagalog, and Vietnamese. The t-shirt for the program was designed to include phrases from each of these languages. Popular events organized to celebrate Albany Park’s multi-ethnic heritage included the Paleta Paseo, the World Fest Architecture Walk, and the International Flag Party & Bike Ride. Go Edgewater - Edgewater is a family-oriented community with a strong interest in strengthening and promoting local business, sustainable lifestyles, neighborhood history, and a sense of community. Events were organized with community partners and businesses to promote these ideals including multiple Edgewater + Andersonville Kidical Mass family bike rides, the Family Bike Ride to EdgeFest, the Edgewater Historic District Walk, and the Green and Blue Sustainability Edge Walk. Email was found to be the most effective way to spread the word about events and the program. Go Garfield Park - This program took place in the traditionally underserved and predominately African-American communities of East and West Garfield Park. Promoting better health and a sense of community were important messages that helped the program connect with residents. Ambassadors attended and tabled at church dinners, food pantries, neighborhood markets, homeless shelters, and PlayStreets block parties to reach residents at established community events. Go Garfield Park began several bike rides and walks at these events. This helped increase participation and establish trust between the community and program. The community’s Golden Dome fieldhouse, an important community hub between East and West Garfield Park, was showcased on program materials to brand the program specifically for the community. The Go Program used four primary strategies to change travel behavior: (1) the hiring of local outreach staff to act as role models (Ambassadors), (2) the distribution of transportation resource kits, (3) one-on-one outreach at community events, and (4) the development of fun, engaging group walking, bicycling, bike share, and transit experiences for residents. The outreach Ambassadors became well known in their neighborhoods as resources for transportation solutions; community organizations started inviting them to existing events and meetings as the campaign progressed. The project team (City, consultants, and locally hired Ambassadors) worked closely with interested community partners in each neighborhood to highlight neighborhood assets, including transportation features such as train/bus access and comfortable bike lanes and routes, as well as the cultural treasures such as community gardens, museums, and local community events. Resources available in the Go Kits included a customized neighborhood map with neighborhood-specific information about local bike shops and supportive businesses and other community assets. Each kit included customized incentives, such as t-shirts, aluminum water bottles, and bike bells. Residents also had the option of receiving a free 24-hour bike share pass and an informational brochure with details about the $5 bike share annual membership for low income residents. The Go Kits included customized information and incentives. In addition, the program sent monthly newsletters to participants while the program was running in their communities. Each community program had a four-month span, during which they received funding and staffing support from the City and consultant team. However, outreach Ambassadors and residents continued each program after their respective end dates. These individuals continued their work on a volunteer basis through a variety of methods including organizing biking and walking events, encouraging bike share, and sharing transportation news and resources to pave the way for long-term benefits. CDOT welcomed this and turned program assets and resources over to the volunteers with a simple Memorandum of Understanding. Each community program cost approximately $US 250,000 and reached 7,500-10,000 households. This cost included program planning and development, implementation, evaluation, outreach staff time, materials printing and postage, incentives, and translation. While this was an appropriate budget for the full-service campaigns, the project team also developed a DIY guide to allow communities to implement their own (less resource intensive) versions of the program. Further, some elements of the campaigns were continued on a volunteer basis by the Ambassadors and/or community partners, such as event hosting and social media engagement. Because of the focus on under-served residents, the program goals evolved away from focusing solely on mode shift and VMT reduction to include additional, more nuanced metrics of enhanced community engagement and behavior change outcomes (such as trying new modes and using transportation options more often). In each community, residents who ordered a free Go Kit were required to complete a short survey about their travel behavior. At the end of each program, participants were asked to fill out a post-program survey with the same travel behavior questions, as well as additional questions about program impact. These pre- and post- program survey results were then compared to determine the effects of the program on participants’ travel choices. 1,516 participants completed the pre- and post- program surveys, a 36% response rate. To distinguish between impacts caused by the program versus other factors, several post-program survey questions specifically asked residents how their sense of community and their walking, biking, and transit behaviors changed as a result of the program. The program also tracked Go Kit sign-ups and event participation rates, social media interactions, qualitative feedback received throughout the program, and comments from in-person focus groups with community leaders upon the program’s conclusion. At the close of each neighborhood program, the project team followed up with resident participants via email to share program impacts and results. This was done by sharing the summary infographic and communicating key metrics, such as how many neighbors participated in the program. Two thirds (65%) of program respondents reported walking, bicycling, or taking transit more often because of the program. (81% of Go Pilsen participants, 64% of Go Garfield Park participants, 61% of Go Albany participants, and 54% of Go Edgewater participants; note that this question was not asked of Go Bronzeville participants). Half (52%) of Pilsen respondents reported replacing at least one car trip with another form of transportation at least once per week as a result of the program. Unfortunately, that was the only community where that question was asked. The program also helped participants feel more informed about local transportation resources. Ninety percent of Albany Park and Edgewater respondents reported feeling more informed. The same goes for 80% of Garfield Park respondents. This question was not asked in Pilsen or Bronzeville. According to post-program survey results, Go Pilsen’s reduced 607.5 trips per week because of the program. This is equivalent to a reduction of 4,252 vehicle miles per week (a calculation based on 2009 data from the National Household Travel Survey (NHTS) assuming that on average people travel 7 vehicle miles per trip on a daily basis). In addition, the Go Program produced positive changes related to community cohesion and community perception. Due to the community area’s crime rates and community perceptions, the Go Garfield Park program Ambassadors and staff were challenged to develop an engaging program that could encourage participation and offer safe and comfortable group outings. The team worked closely with community stakeholders to confront these challenges. Each program continued on afterwards as a community-based initiative, independent of the original grant funding. This extension past the original grant timeline indicates great cost-effectiveness, since the programs continued on without the original funding source. In some communities, tensions and in-fighting posed a problem between certain community groups. Program leaders were clear from the beginning that they intended to work with every community group who was interested in getting involved and promoting active transportation options. Program staff emphasized that they would not favor any particular group. Ambassadors and the program team also realized the importance of speaking to residents of all ages including children and the elderly. By being inclusive to all community members and organizations, the programs were thought of as being made for and available to everyone, regardless of age or physical ability. Having quirky, unique, and fun events was key to getting residents out walking and biking. Residents often had competing priorities for their time; organizing unique programming helped capture residents’ attention and encourage them to try something new. Go Pilsen, for example, organized a Market to Garden Bike Ride which included delicious drinks made by a bike-powered smoothie machine. 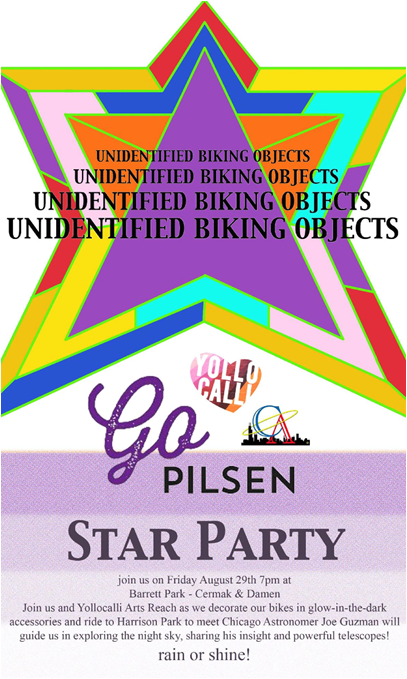 Go Pilsen’s Star Party Bike Ride involved decorating bikes in glow-in-the-dark accessories and ending the ride with a telescope star-viewing party and lecture led by a local neighborhood astronomer. The Bike Like a Viking Ride was a unique chance for residents to have fun, dress up, and bike to a community destination. Collaborating with community partners was essential for developing community trust and spreading the word. Program staff began working with stakeholders at least four months prior to the beginning of each program. These leaders provided insights on how to reach residents through messaging and communications. They also became important event partners who helped us tailor events to community needs and interests and helped expose hundreds of residents to transportation resources and experiences in each neighborhood. Neighborhood Selection Criteria: Participating neighborhoods were selected due to a variety of factors. In addition to selecting neighborhoods that featured a variety of transportation options and active community organizations, the program sought to involve racially-diverse, traditionally marginalized communities. Ambassadors reflected this diversity, as they were hired from the communities in which they resided. Youth Empowerment: Although the program targeted individuals who were at least 16 years old, the age one could acquire a driver's license, the program built relationships with several other youth-centered initiatives. Go Pilsen, for instance, created a Junior Ambassador program. Fueled by a separate grant, one of the Go Pilsen Ambassadors trained and led youth in program outreach. The youth learned valuable skills and amplified the program’s outreach capacity. Program Continuation: The Go Program was so successful that in each neighborhood either the outreach Ambassadors or community leaders stepped forward to take ownership of the programs once the limited-term, four-month campaigns had closed. In this way, The City’s four-month grant funding for each project seeded future growth. Outreach Ambassadors and residents continued the initial campaign’s momentum on a volunteer basis. This is a testament to the program’s relevance and ability to build community buy-in. The program described in this case study was designated in 2017.